Yesterday morning when I turned on the radio the first song I heard was Yellow by Coldplay. This song always reminds me of my Dad. It doesn’t necessarily bring back particularly happy memories for me. It was one of the songs that played on the car radio when we drove to find out his test results for his brain scan which confirmed a brain tumour which was sadly later to kill him. Funnily enough I love the song and it doesn’t upset me when I hear it, in fact it makes me feel incredibly close to my Dad. I always listen carefully to the words that Chris Martin sings “look at the stars, look how they shine for you and everything they do, yeah they were all yellow”. To hear that particular song yesterday morning was, I felt, a sign from my Dad that he was sending me huge encouragement. Many of you will know that yesterday I was competing in my first ever dressage test with my young horse. Between both of my parents my Dad was always the encourager, the one that pushed me, whereas my Mum was always the careful and cautious one. So at a time when encouragement was required I believe he was with me yesterday telling and willing me to “go girl, you can do anything you set your mind to”. Yesterday was a day of firsts for me and a rather big deal. I’ve never competed before and hadn’t had my new horse for very long. In fact some of you will recall I was even thinking of selling him at the beginning of the year, but with lots of hard work on both our parts, we have turned a corner. I decided to push myself and move out of my comfort zone and enter a competition and I am pleased to report that we came 7th in our dressage test. Yes, there is a lot of room for improvement but we were placed and more importantly we did it. Another first for me yesterday was I learnt to drive a 3.5 tonne lorry, another achievement and one I have to confess I am rather proud of. I should however add that I would not have been able to do this without the encouragement from a friend. Sometimes all we need is someone to tell us we can do something, someone who believes in us and of course I’m lucky enough to have my Dad who has been watching over me and encouraging me every step of the way. It just goes to show that whatever our age it’s never too late to start or try new things, it’s good to challenge our brains with a new hobby or direction and I rather think it gives us a new lease of life. Whatever stage or age we are in our lives we can always begin or try something new. So if you’ve been thinking of learning something new or different my advice to you would be to go for it and as the saying goes it really never is too late. Remember life is for living. I would be interested to hear from you if you have recently started to learn something new or have pushed yourself and was amazed at the results. 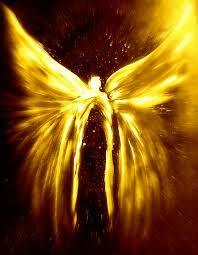 Wishing you a very happy love filled week and may the yellow stars shine on you. This is a question I like to ask because I believe it makes us think about how we choose to approach life. 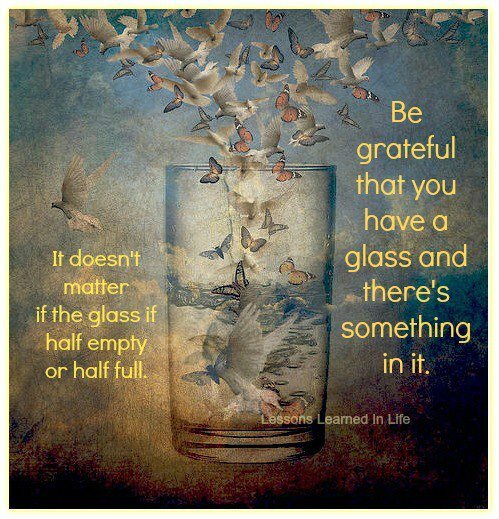 I used to be a bit of both depending on what was going on in my life, however over the last few years I’ve tried to turn this around and look at my glass as always being full and I am so very grateful that I even have a glass to fill in the first place and how lucky that makes me feel. We are lucky in so many ways but only if we stop to really think and appreciate what we have. There are many things we can do to be positive but when things are going wrong or not as we planned we tend to get bogged down and can start to slide speedily down that slippery slope. So this week I would like to share some thoughts and some of my ways of being that little ray of sunshine and trying to find that silver lining on every cloud. For me, it starts in those magical moments when we first wake in the mornings. For example, how do you choose to greet and start your day? Is it thinking of all the things you have to try to fit in during the day and how on earth will you do it or do you linger in bed a little longer and look forward to your day? I believe the first thoughts that we have in the mornings can set our mood for the day. The first thing I do is smile at the thought of a fresh new day, a fresh new start and I say to myself that it’s going to be a beautiful day. By doing this, I have already set my intention that it will be a beautiful day. Not once do I allow myself to focus on anything negative that I might have to do, and believe me, there are usually things I’m not so keen on doing on any given day but I don’t allow them to dampen my spirits. I bring to my mind all the good things in my life and give thanks and am truly grateful for all I have. The most obvious one is I am grateful that I had a good night’s sleep in a lovely warm bed with a roof over my head and more importantly, I’m thankful that I woke up and now have another day ahead of me full of possibilities. When the trains are delayed I don’t complain and say “it’s going to be a bad day”. I try to shrug it off, I see my fellow commuters becoming stressed and agitated but it’s outside of our control and we cannot control anything else other than our feelings and I choose to have good feelings. In this day and age, I can make use of the any time that is spent delayed and can log on to my e-mails from my phone and start working or I can catch up on reading or even my sleep if I’ve been burning the candle at both ends. It really isn’t the end of the world. Yes I might arrive at work or home a little bit later than usual but so what. In some of my previous blogs I’ve mentioned how infectious smiling can be, I try to be happy and smile throughout my day, sometimes people ask me whether I’ve been drinking because I’m showing real signs of happiness. Isn’t it sad that people have to ask us this question when we are happy? Shouldn’t we all strive to be happy at all times? When I pay for my lunch or a cup of tea or coffee I am thankful that I have the money to do so and that I have something to eat, especially when there are people in this world who barely have fresh water to drink. More importantly, I am thankful that I have a job to get up for and go to, which in turn allows me to purchase that cup of tea or coffee. By appreciating more things we become more aware and in turn our happiness stakes are raised. Admittedly at some point throughout our lives we will suffer loss, loss of friendships, relationships and even the loss of some of our friends and family members through death or illness but as someone once pointed out to me “this is life” and nothing is forever. It’s how we choose to deal with it that counts. For me, whenever I have lost someone close, especially through their passing I realise that life is so very short and we should make the most of it, but more importantly instead of complaining about things we have no influence over we should really appreciate everything whenever we can, especially things we can influence and we can influence how we choose to feel. When I wake up each morning I choose to feel happy. I appreciate what I have in my life, my family, friends, animals and nature. I am truly thankful and with thankfulness comes happiness. If every morning you can find a reason to say “yes, it’s going to be a beautiful day” and every night you find a reason to say “yes it was a beautiful day”. Then one day, we can look back and easily say “yes it was a beautiful life”. Wishing all my readers a week full of positivity, love and happiness. It now seems that many of us are spending more time at work than ever before. We are working longer hours and most of us have fast paced lives so it’s hardly surprising that we become stressed. Tap in the word stress on a computer and any Google search will produce many lists and ways on how we can reduce stress. It seems we are all aware that we have it but we don’t know how to reduce it. For me, one of the most obvious ways to reduce stress is by having a hobby, something that we enjoy and that allows us to forget about the daily grind and to just be in the present moment. The list of hobbies that we can do, and that are available to us, is endless but the main purpose of a hobby is that it is something we enjoy doing and it allows us to take a break from our busy schedules. Depending on the hobbies we choose they can prove to be challenging, especially if we are learning something new, for example learning to play a musical instrument, a game of golf or learning a new language. My regular readers will know that my main passion and hobby is horse riding and I have had one of my horses for 19 years. I love that it gets me out in all weathers and even just being around horses has a calming and relaxing effect on me. It has certainly helped me when I have been going through very difficult times, especially when my parents were diagnosed with terminal illnesses. I consider myself extremely lucky to have recently been able to buy a younger horse to bring on so when my older horse is ready to take life a little bit easier she can enjoy a happy retirement and I can still continue with my passion. As some of you may know, learning to ride this new horse has proved to be a challenge for me, but with supportive friends and a good instructor we have improved and I have even entered us into an introductory dressage test in a few weeks’ time. I have never had any interest in dressage before apart from watching Charlotte Dujardin’s outstanding performance during the 2012 Olympics. The test will involve me instructing my horse to perform a list of movements around the arena, joined together by transitions of walk and trot. I have had to learn the test and whilst I can have someone read the test out to me on the day to tell me where I have to go, it’s actually far better to learn it as well. I’ve rather enjoyed the challenge of learning the test, which I’ve learnt on paper and in my head. The experts say it’s best not to actually ride the test too many times beforehand on your horse as it may start to anticipate what comes next and the test then won’t flow so smoothly. When we are faced with the challenge of learning something new or anticipating something that we enjoy we still experience stress but but this is a positive kind of stress known as Eustress “good stress”. This type of stress keeps us moving forward and motivated and makes us feel fulfilled. I know that when I come to ride my test in a couple of weeks’ time I will be stressed but it will be the good stress born out of the desire to do well and to complete it successfully. When we have hobbies, assuming it isn’t a solitary one, it puts us in touch with other like-minded people and we make new friends, some even becoming close and long-term friends. So by doing the things we love and enjoy we meet like-minded people and as such we expand our social circle. My hobbies are mainly outdoors based and they allow me thinking time away from everything else. I am much more creative when I’m outside in nature listening to the birds sing and watching the sun come up or go down. This creativity then feeds into the other hobby that I enjoy which is creative writing. As well as relaxing us and making us happy, our hobbies can physically tire us out so when it’s time to sleep we are ready to enter into that wonderful world of slumber where we can dream and restore our mind ready to be productive for our day ahead. 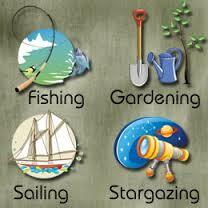 Hobbies are good for our mind and our body which in turn also has physical health benefits. I would love to hear from you and what hobbies you enjoy or inspire you, especially if you have any unusual hobbies. Wishing all my lovely readers a week filled with love and happiness and don’t forget to make time for your hobbies.